In the Vietnam War, 2,197 helicopter pilots and 2,717 crew members were killed. Bob Ford was a Huey aircraft commander who flew over one thousand missions from July 1967 to July 1968 and survived. 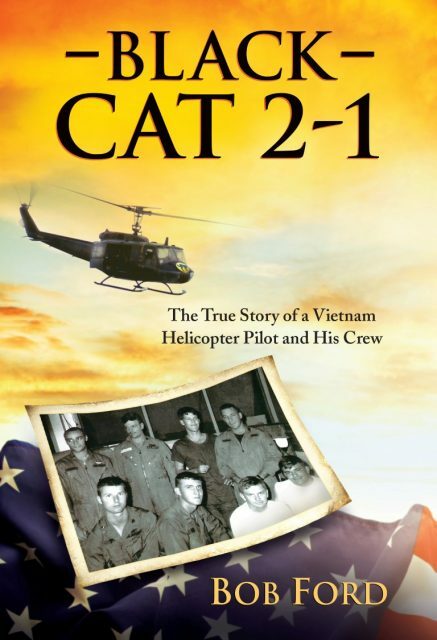 Now Ford pays tribute to the valiant men he served with and to those who risked their lives for the troops on the ground in his praiseworthy memoir Black Cat 2-1: The True Story of a Vietnam Helicopter Pilot and His Crew (Brown Books Publishing Group). Ford has written a gripping page-turner that reads like a thriller, captures the humor of the men at war, and resounds with respect for those who served with honor. 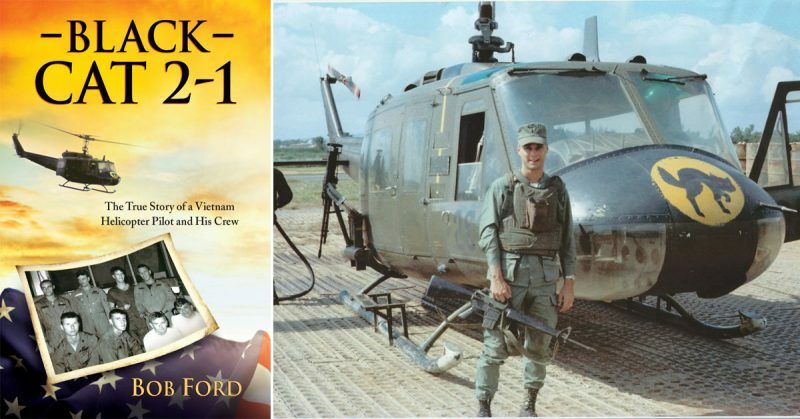 To learn firsthand what Black Cat 2-1 really means, Ford invites readers inside the cockpit of the Huey helicopters he flew when he and his men dared to protect and rescue troops on the ground. They would holler, “Let’s crank it up—Let’s kick the tire and light the fire” before starting the Huey’s turbine engine—even though they had skids and no tires—they figured that’s what the guys that flew high performance jets said. 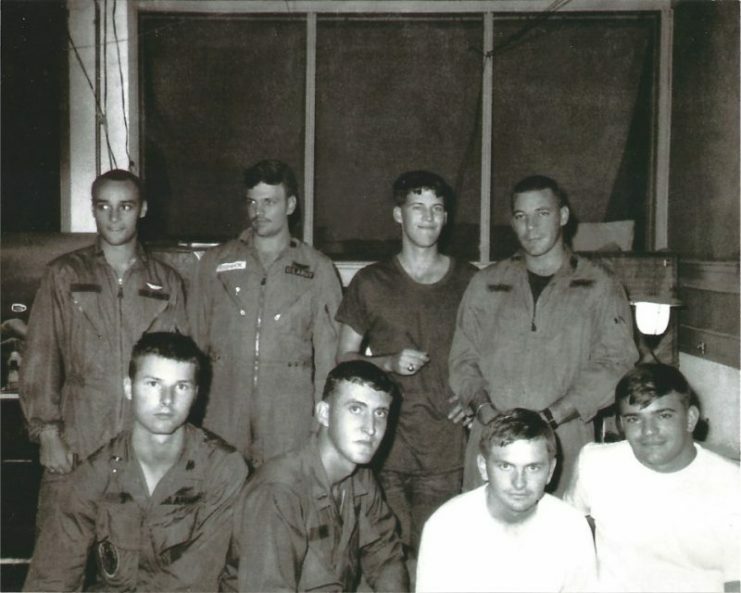 Black Cats Hue detachment, Bob Ford standing 3rd from left. Chuck Yeager, Sergeant York, Audie Murphy, Eddie Rickenbacker, Ike, and Jimmy Doolittle— these are the men who first captured the imagination of Bob Ford and instilled in him the feeling that every man should be willing to serve his country in the military. For readers who served in Vietnam, Ford recreates the danger they survived. For others who knew little about this war, he offers a positive story about men who served, giving voice to those who fought but were silenced, and to those whose stories have never been told. As our helicopter neared the landing zone, the radio barked, “Alley Cat 3-4, this is Black Cat 6.” Alley Cat was the call sign for our gunships. Hebert, the pilot, told the gunners we were going in hot, which meant our two door gunners were to shoot their M60 machine guns continually at any enemy or suspected enemy emplacement. Adrenaline rushed through me as I heard the explosions of the 2.75-inch rockets from the gunships finding their targets in and around the landing zone. I heard the sound of the M60s in the back of our ship start firing. The landing zone (LZ) had been prepared by the gunships, and every ship in the lift had ample room to land. I did not see any enemy muzzle flashes. The troops jumped out and were gone within seconds. I was surprised when Hebert said, “You got it,” which meant he was transferring control of the ship to me. “I got it,” I responded, taking control. Hebert lit a cigarette. It was my fourth day in Vietnam. Light rain, the smell of human waste, and a mass of military activity—these had been my first impressions of the country. After a brief stop at Wake Island, we had landed at Pleiku, in the central highlands. I headed toward the Command Center to receive my first assignment. As I carried my army-issued air force duffel and L.L. Bean canvas bag, my legs felt like rubber from pure fear. Mud oozed through the airstrip’s perforated steel planking. After storing my gear, I was told there were no openings in the First Cavalry, so I spent the rest of the day familiarizing myself with the compound. I was given the location of a bunker in case of a rocket or mortar attack. The next morning, there was still no assignment. I was beginning to feel more relaxed. My fear of death was subsiding, but it was replaced by a fear of the unknown. As I walked by a Quonset supply hut, I saw an infantry captain who looked like a real veteran. He wore regular olive drab fatigues and carried a pair of worn jungle fatigues that were faded from his year in the field. He started to toss the old fatigues into a small pile of discarded clothing near the hut, and I asked what he was going to do with them. “Leave them right here,” he answered. He spoke with such intensity that his words were permanently etched in my mind. I could tell he had respect for pilots and that he’d depended on them to stay alive. It made me proud to be an army aviator. From July 1967 to July 1968, Bob Ford flew over one thousand missions in Vietnam. 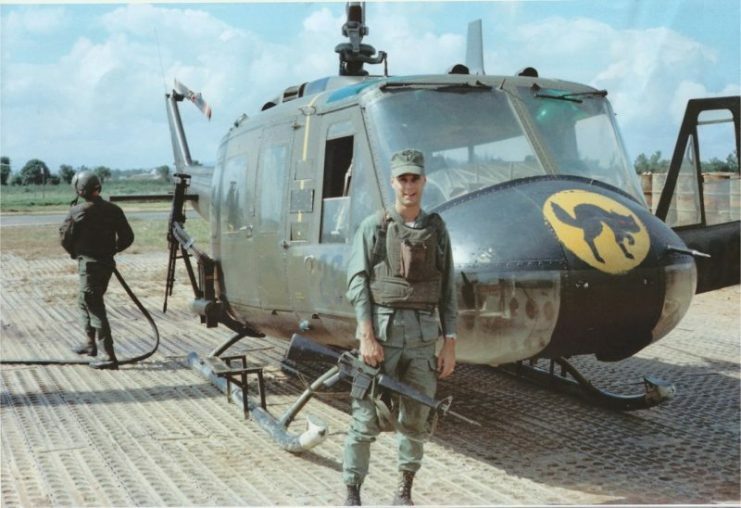 After the first six weeks, he became an aircraft commander and took over the command of a helicopter detachment at Hue, forty miles from the DMZ—the farthest northern helicopter unit in Vietnam. His tour included the beginning of the siege of Khe Sahn and the Tet Offensive in February 1968 when he and his men manned the perimeter for a three-day and three-night ground attack. Ford made his commitment to flying helicopters when he was still in college at the University of Oklahoma. 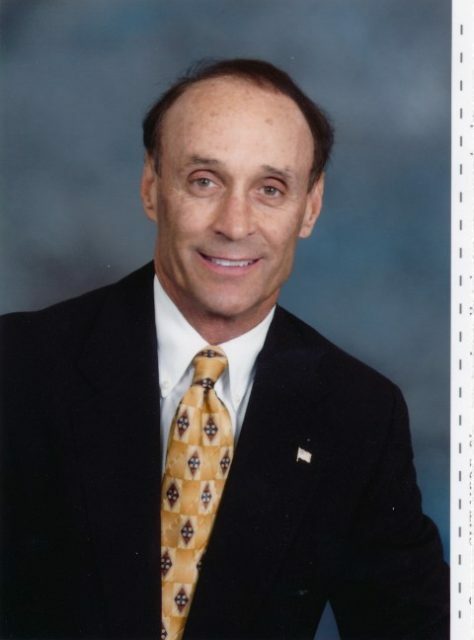 He completed ROTC training and received a commission in the US Army in 1966. He volunteered for army helicopter flight school and within one year was flying combat in Vietnam. When he completed his tour in Vietnam, he became an instructor pilot at Fort Wolters, Texas. Following his discharge in 1969, he moved to Okeene, Oklahoma, to head the Okeene division of the family flour milling business, which he still actively manages.